As Shakespeare enthusiasts, we’re constantly looking around for more creative ways to make Shakespeare both exciting and accessible for all. 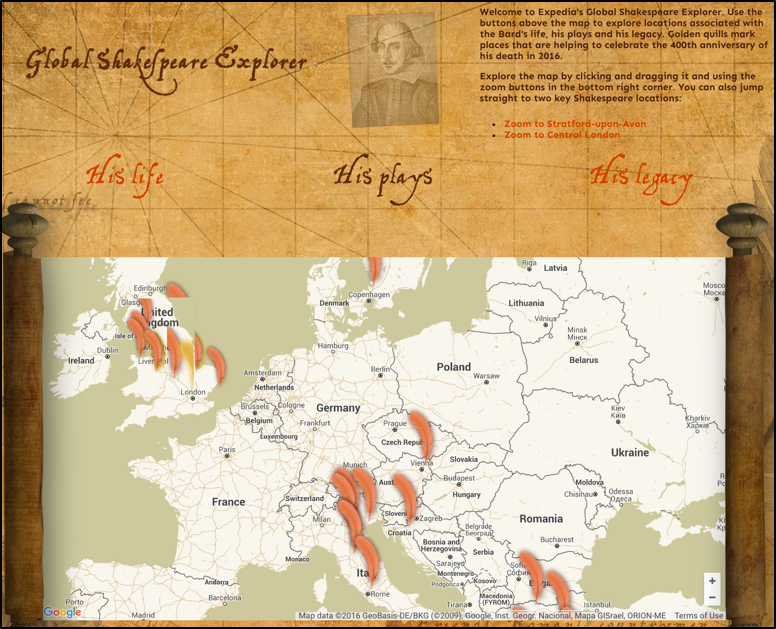 This year, as we’re celebrating 400 years since Shakespeare’s death, we’ve seen an abundance of fun tools, quizzes and interactive maps but one that we found particularly interesting was Expedia’s Global Shakespeare Explorer. This newly launched interactive map acts as a great commemoration to #Shakespeare400 by celebrating all of Shakespeare’s plays, his life and his extraordinary legacy. These three filters allow viewers of the map to immerse themselves in worldwide locations that have been influenced by Shakespeare’s work. Theatre companies, upcoming performances, exhibitions, festivals and Shakespeare-inspired monuments are among the celebrations featured. There is also a collaborative element to the Explorer: As the 400th anniversary year progresses, Expedia is contacting Shakespeare organisations to help add new items to the ‘legacy’ category, and allowing users of the map to submit their own tips. For travellers, the map is designed to inspire Shakespeare pilgrimages – not just to Stratford-upon-Avon but also to other events and locations worldwide where the Bard’s legacy is celebrated. You’ll find some of the most extraordinary events on here – many of which you probably didn’t know existed! For example, there’s a Shakespeare Jazz Show that tours the USA, a life-size paper model exhibition created by Birmingham City University students, as well as Shakespeare events on the beach over in Vancouver. If you want to find out more, make sure you also check out Expedia’s article on 6 Unusual Celebrations of the Bard around the world and join the Shakespeare celebrations this summer!